Becoming a tech-savvy teacher is great. Running a flipped classroom is impressive. Doing a variety of hybrid and blended learning is incredible. Does this make you a modern teacher, though? Honestly, there’s more to it than just hopping on the latest education technology / education trends bandwagon. I know many teachers who throw an iPad into a classroom like a grenade and run away. They don’t successfully implement education technology or really any type of engaged learning for that matter. See Also: Which of the top edtech trends are best for classrooms? So, then, what does it really take to be a modern teacher? This term has been cropping up since the general consensus seems to be that the term ‘21st century teacher’ is outdated and a bit awkward. Some make the same argument for the ‘modern teacher’ mind you but that’s about semantics. You want to know what it takes to be a progressive and always-learning teacher who knows how to get students to think, contemplate, and explore. Well, here goes! see themselves as co-learners, not teachers. allow themselves to fail, often. 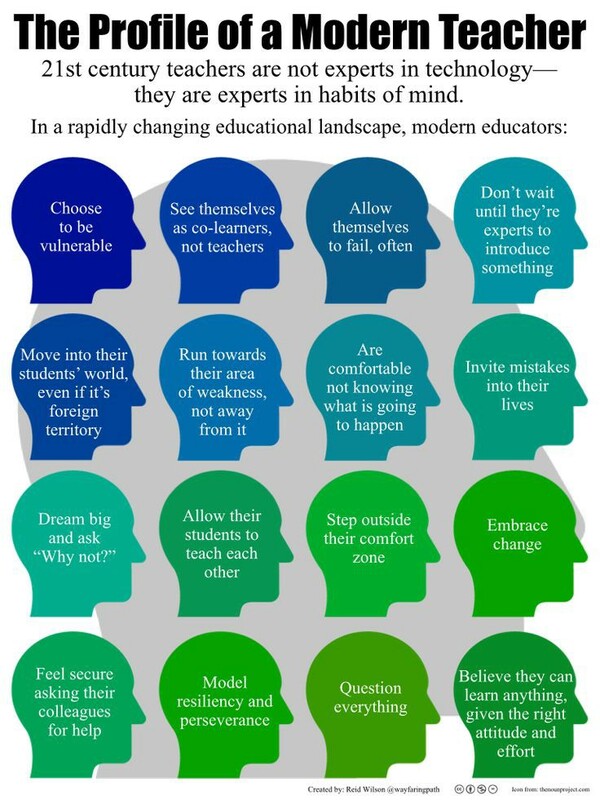 These characteristics of a modern teacher are incorporated into the visual you see below. It’s from Reid Wilson. Why use ten words when you can use nine. Made you count!